Down & Out Books has been busy, very busy! We’ve got 10 books coming out between now and the end of the year. And you want to read them! 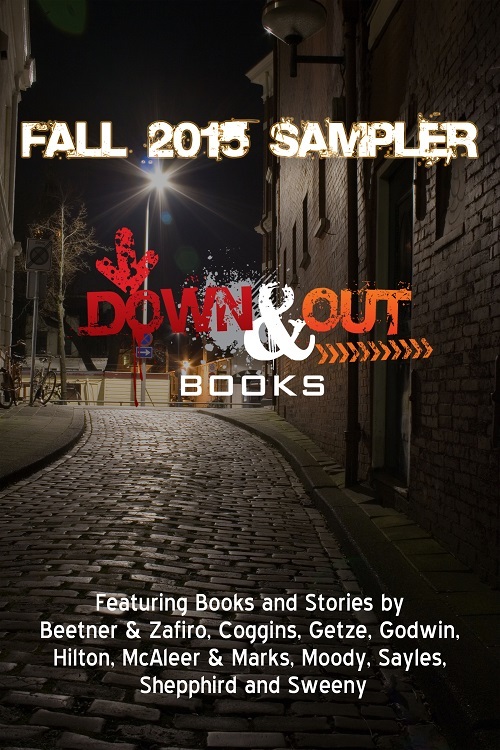 For the first time ever, you can read samples from each of the forthcoming releases. For FREE and in one place. September sees the release of three books from Down & Out Books: Frank Zafiro and Eric Beetner team up for the darkly comic The Backlist; Jack Getze brings back Austin Carr for his fourth outing in Big Shoes; and Bill Moody is back with a short story collection appropriately titled Mood Swings (only available in print through D&OB). Six books are coming out in October. Five novels: No Hard Feelings, an August Riordan mystery by Mark Coggins; Wrong Crowd, a noir thriller by Richard Godwin; Warpath, a Richard Dean Buckner mystery by Ryan Sayles; John Sheppird has the second in his trilogy of deception, Kill the Shill; and Welcome Back Jack, introducing Albany detective Jack LeClere by Liam Sweeny. And we’re wrapping up the month with an anthology, Coast to Coast, crime from Faneuil Hall Marketplace in Boston to the Vincent Thomas Bridge in the Port of Los Angeles, edited by Andrew McAleer and Paul D. Marks. In November, Matt Hilton’s ninth Joe Hunter thriller, The Lawless Kind, will see the light of day in the U.S.
Want all ten trade paperbacks? Get all of ’em for $125, which includes shipping within the U.S.